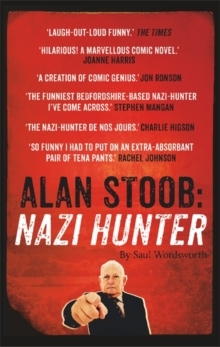 Alan Stoob is a seventy-something man living in Bedfordshire who, inspired and mentored by Simon Wiesenthal, hunts down Nazi war criminals – you’d be amazed how many of them choose Bedfordshire (particularly the Dunstable area) as a hiding place. You can follow Alan on Twitter and also visit his website to get a sense of what kind of man he is. Alan Stoob: Nazi Hunter takes the form of Alan’s diaries, detailing his Nazi-hunting escapades as well as his domestic life with his formidable, spirited wife Edame and his middle-aged son, who is suffering from a form of arrested development and consequently behaves not just like a young teenager, but a young teenager in the late 1980s. Alan Stoob is an outstanding suburban comic creation on a par with John Shuttleworth or Adrian Mole, and it’s absolutely impossible not to like him. The absolute seriousness with which he takes his vocation is genuinely endearing as well as incredibly funny, and despite the absurdity of Alan as a character and of the plot of the novel, there is also something weirdly convincing about him. We might not know any former policemen who have devoted their retirement to catching elderly members of the SS in the Dunstable area, but we probably have met a man who is, fundamentally,just a little bit like Alan. He's a creation in that great British tradition of unwittingly absurd men of a certain age taking themselves very seriously - think Charles Pooter or Captain Mainwaring. Every detail of Alan and his life is pitch-perfect and brilliantly well-observed, and it’s been a very long time since I read a book that made me laugh as much as this. It’s relentlessly funny, but it also has an affectionate warmth to it which I greatly enjoyed. I suspect this is a book I will read again and again - certainly whenever I want to be cheered up. I couldn't be more proud to have a signed copy.